Global brand of Turkish aviation sector, Çelebi, has taken another important step to further enhance its organizational structure as part of its efforts to grow in the international arena. Continuing its strong progress in global markets, Çelebi appointed Onno Boots as CEO of Çelebi Aviation Holding. “Boots brings a wealth of experience to support the further expandion of Celebi’s International footprint through leveraging its undisputed leadership position in the Turkish market” Çelebi Aviation Holding Chairman Can Çelebioğlu stated. 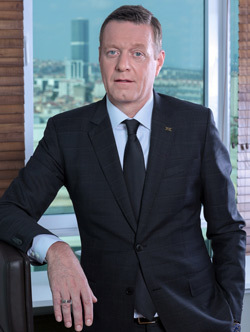 With its strong and successful growth strategy in the global aviation sector, Çelebi Aviation Holding continues to expand its business outside of Turkey in an attempt to firmly establish Celebi’s sectoral leadership aspirations to become a major global force in its industry in the next 3-5 years. Offering cargo and warehouse and ground handling & passenger services in two continents, five countries and 36 airports, Çelebi Aviation Holding continues to take determined steps to enhance its organizational structure as part of its strategy to grow in the international arena. Çelebi Aviation Holding had earlier taken an important decision and created a CEO position in line with its global targets. Following the decision, Çelebi Aviation Holding Executive Board Member Canan Çelebioğlu has taken charge as the CEO. With the appointment of Onno Boots, Canan Çelebioğlu handed over her position as the CEO of Çelebi Aviation Holding as of 1 October. Along with 31 airports in Turkey, Çelebi Aviation Holding successfully provides ground handling & passenger services at Budapest-Hungary, Vienna-Austria, and Mumbai and Delhi airports in India. Carrying out activities in two continents, Çelebi Aviation Holding also offers cargo services and warehouse operations in Frankfurt-Germany, and Delhi-India airports along with its activities in Istanbul. Çelebi Aviation Holding’s new CEO Onno Boots will be responsible for all global activities of the Holding. Stating that Çelebi is preparing stronger for tomorrow in line with its target to grow internationally through enhancing its organizational structure, Çelebi Aviation Holding Chairman Can Çelebioğlu said, “Çelebi Aviation Holding took an important decision to strengthen its organizational structure and strengthened its regional management teams. We created the Çelebi Aviation Holding CEO position last year and Canan Çelebioğlu had taken charge as the interim CEO. With Boots’ recent appointment into the position of Group CEO he will be taking over from Canan Çelebioğlu. Boots’ appointment comes at a critical stage of Celebi’s Global expansion strategy and with his background and experience we are confident that we can accelerate growth of Celebi’s business globally and position itself as a global leader in the Industry. Boots ( a born Dutchman) started his career in the Logistics industry in various senior roles working for multinational companies in both the Forwarding and Airline Industry prior to joining TNT Express. During his career in TNT of close to 25 years, Boots designed, set up and managed the Companies’ Global Accounts division for a period of 10 years. 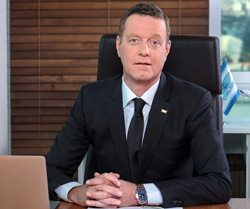 During his tenure the business grew to in excess of EUR 1 Bln, before being transferred to Asia to head up the Group’s business in South East Asia and India, based in Singapore the Companies’ regional headquarters. During this time Boots launched and successfully implemented a major 5 year growth initiative for TNT in the Region and managed to double its market share, whilst considerably expanding the Companies’ footprint and presence in the Region. Most recently, during the past 2,5 years Boots successfully established his own business and was involved with a number of different business ventures ranging from private equity firms to multinational companies in the logistics industry. Onno Boots has taken over the Çelebi Aviation Holding’s CEO position as of 1 October 2014.